My original plan was to fly with this airline on a return trip to Seoul from Hong Kong. 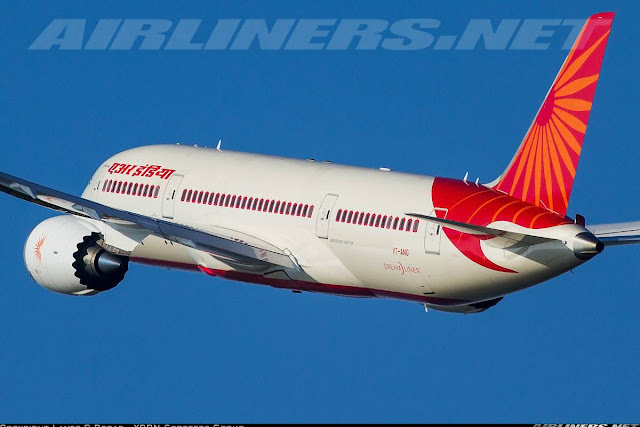 However, the outbound flight was at 0805, it was a bit risky since my CX 714 flight arrived in Hong Kong at 0515 and any delays will definitely affect my connection and since both are on separate tickets, Air India will not entertain me if I miss the flight. I looked at the possibility of flying one way up to Seoul with Jin Air and return to Hong Kong on Air India instead, but it was too expensive, then suddenly I had this idea of going to Osaka then fly from there to Seoul. So I did some search on the airlines that fly on this sector and Air India does fly on this route on certain days. Flying with Peach Aviation to Osaka was a brilliant idea too so with that in mind, I booked my Peach flight first then waited for a while to pick up a bargain on Air India and luckily for me, $231 for one way Osaka to Hong Kong became available, about the same price as Peach and I booked it instantly! Some times, it pays to wait! I remembered once I vowed not to fly with this airline at all cost, how times have changed. Now this airline is operating the 787 on HKG-ICN and HKG-KIX routes, I think its time to give the airline a try, not only get to fly the fabulous 787, a new engine type for me - the GEnx engine that powers Air India's fleet of 787s. I heard lots of horror stories about this airline and how poor the state of some of the new aircraft are, so let me find out for myself. I don't trust the airline's management but I think for maintenance wise, the airline should be ok. Sorry, I have no photos of the website. Its surprisingly good, guess the IT folks at India know what they are doing. The interface is quite easy to use and there is no problem booking your flights and also manage your bookings. However, there is no mobile version so if you try to access the website on your mobile phone, it will still be the web version. I would recommend you to either use PC or the tablet to access the website. Managing your booking allows you to choose your seat (at no course), choose the type of food and make changes to your flight. So for this, I will give the airline some credit. I arrived at Osaka the night before with Peach and stayed at the Nikko Osaka Airport Hotel just a few minutes from terminal 1. I managed to grab a bargain of S$120 for one night and it was a great night stay at the hotel. Unfortunately, even though my room was facing terminal 1, I wasn't able to photograph much from the room. Once checked out from my hotel at 11.50, I made my way to the airport and about 10 minutes later, I was at the Air India check-in counter. I had done the on-line website check-in but to my disappointment, there wasn't a counter for it and had to join the long queue consisting of mainly Hong Kong passengers. Fortunately, it didn't take very long before my turn came. The nice Japanese lady did some enquiries since my ticket was an one-way and not before long, I got my boarding pass! Here are some photos. It took only 5 minutes to walk over. When I reached the Air India counter, there were already passengers queueing up and there wasn't a separate queue for online check-in passengers. My boarding pass for my flight to Hong Kong. No questions were asked about my one-way travel. I chose 14A so that I could have a good view like this. After checking in, I went to the air side to enjoy some plane-spotting activity. My ride to Hong Kong: VT-ANG. Just entered the air-side of KIX. Checking my flight status, surprisingly its departing 10 minutes earlier. You don't see this anywhere else. Air Asia X to Kuala Lumper? Next time, perhaps. Since my gate was at number 3, I took the skytrain on the right. The airport is pretty pleasant, with English signs everywhere so its not easy to get lost. Lufthansa's Boeing 747-400 heading back to Frankfurt. EVA Air's Airbus A330-200 being prepared for departure back to its homebase, Taipei. Asiana's Boeing 777-200ER being prepared for departure to Seoul. Went to my gate shortly after finishing shooting a few interesting subjects. Credit goes to the respective photographers. Do you like the airline's livery? I am surprised that boarding started early, I think it was due to another round of security check at the aero-bridge. My bag was opened and checked and I was questioned (just some routine security check). It was a fast and smooth process and soon I was on my way to the Dreamliner. I was excited and looking forward to my 5th ride on this beautiful aircraft. 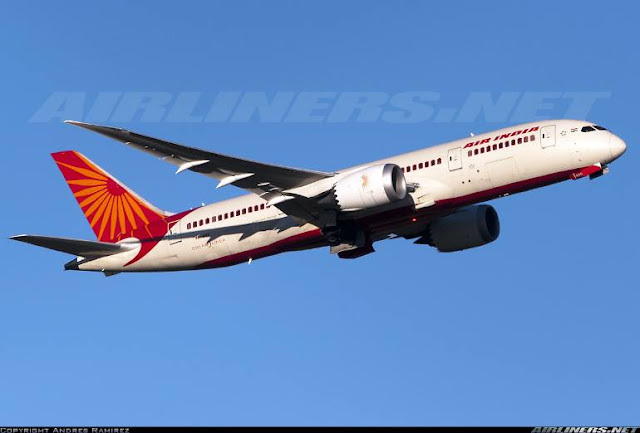 First GEnx powered Dreamliner and first Indian carrier for me, lots to look forward to. I kept low expectation for this airline since I heard lots of negative reviews. I saw two cabin crew probably in the 40s standing at the door looking quite stern. Both of them didn't pay much attention to me and so I walked in without acknowledging them. As my seat was the 3rd row from the L2 door, I didn't have to walk far . I was also glad that it wasn't a windowless seat, in fact I had a great window view! More passengers boarded and most of them were from Hong Kong, taking advantage of the cheaper airfare compared to their home airline, Cathay Pacific. I am surprised they didn't mind flying on this airline which had been in the news frequently for unwanted reasons. Once the doors were closed, I had the 2 seats besides me empty. That was absolutely great news for me and looking around me, it was about 60-70% full. As my seat was pretty close to the front crew, I was worried about taking photos and video during taxi and take-off but the crew didn't care, I was pretty sure she saw what I was doing. The crew so far had been disappointing, they certainly could learn a lot from the Koreans and Japanese! But like what others have mentioned, its the cultural issue. I would prefer seeing younger and prettier crew on board my flight, but never mind. The plane pushed back early and we made our way to runway 24L for a quick departure! We were number 3 for departure. Here is the video of the take-off! Here are some photos of my seats and the cabin of the aircraft. Quite a nice interior if you ask me. Air India's IFE product is actually not bad! You also have the USB plug available for charging. The colours of the seats makes the cabin looks warm and cozy. Love the colours, I think the airline has done well in this area. Checking out what's available on this IFE system, I was quite disappointed that there wasn't much interesting English Blockbuster movies, in fact the latest movies according to the system here were pretty much unknown to me. I decided to watch "12 years of slavery!" which turned out to be a great movie. This was my seat, a good one actually. Had 2 windows to myself and of course the engine view! Legroom space is not too bad, felt comfortable with it. The 3-3-3 seating layout doesn't give you that much cramp feeling compared to the 3-4-3 on the 777. The famous 787-8 window with the button to adjust your window screen. Remote control - an alternative if you don't like to press the screen. That's how front I am! The crew sitting there should be able to see what I am doing, guess I was lucky she didn't told me off. The difference between both windows! What I really like about the 787 windows is that you are able to see outside even when its at the dimmest mode. Quite a number of empty seats in my section. No one else on the aircraft cares more about this plane than me! Looks quite tight, but its actually not that bad. The airline's logo on the small screen of the remote control. I wished the flight was longer! Foldable tray which I find it quite useful. If only there is a drink holder then there is no need to open the foldable tray. Do you like the seat colours? This reminds me of Qatar Airways' cabin. I love the cabin as its pretty cool and cozy. I find that flying on long haul on this aircraft would not be a problem for me. Previously, I have flown on ANA and Royal Brunei's 787 and I think if you exclude the seating configuration (NH's 2-4-2), I prefer this cabin to the other two. The fleet of Air India! The airline is retiring the Boeing 747-400 pretty soon! I noticed there is WiFi installed on this aircraft, guess the connection is for the crew just in case if a problem occurred while on duty. My headset wasn't working so I had swap with the seat beside mine. Sound quality is low but at least the sound was loud enough to block other noise. Before the meal, I made a visit to the toilet and this is what I got! Like my previous 787 experience on Royal Brunei, there is no instruction on how to open the door. Luckily this time round, I managed to open it without difficulty. The flash sensor system wasn't working, you have to close the cover then it flushed automatically. Once the little tour around the cabin was done, went back to my seat and just in time, drink and snack were served. Each passenger were given a bag of peanuts and a choice of drink. The crew gave me two, unfortunately I am not a fan of nuts, I wish there was a choice of perhaps cake or peanuts but anyway I took them. What a good way to enjoy the 787 flight with my favourite Tomato juice! I had a 2nd round when the crew came back and asked whether I wanted some more and luckily I did because during meal service, we were not given any drinks. Thumbs down for that! About an hour in the flight, we encountered some turbulence. It was not that bad actually, but the pilots made everyone including the cabin crew seat down until it becomes smoother. I was curious about one thing, we were flying at FL400, at the top of the clouds, couldn't the pilots request for a higher flight level, perhaps FL430? That was in my mind while enjoying some bumps. The turbulence lasted for 15 minutes and then the crew started serving lunch. I had a choice of chicken or fish, I chose the former. Its quite yummy! Only thing is the appetiser is a bit of a disappointment, the vegetables were cold and hard but the rest of the meal was good. The dessert - rice pudding was great. After the meal was served, the crew came around and served tea and coffee. I felt the lady serving my row did a rush job, she could have slowed down. Once the meals were done, the crew disappeared into their "chamber", not one came round to check whether all of us were comfortable. Guess at that time, I was already used to the excellent Korean and Japanese hospitality. As for the flight crew, no announcements from them at all, it was done by the senior cabin attendant. Here are some window shots, the view of the engine and wing of the 787. The distinguished sound of the General Electric engine was heard, but it wasn't as loud as the GE90-110/115B. Enjoying a smooth take off from Osaka Kansai Airport, flying over Osaka. During the flight, all the window shades were turned dimmed by the crew and there was no way to change it until the crew unlocked the system. Once we started descending, they unlocked it and I was able to switch it back to the normal mode. Beautiful weather in Hong Kong! Landing was very smooth and we touched down on runway 25R. Here is the video of the landing! We waited at our tarmac for about 10 minutes before taxing to our gate, at that time the airport was pretty congested but we still managed to arrive before our scheduled arrival time. As you guys know this airline has management issues, coming out in the news frequently for the wrong reason. A potential star alliance member? Its hard to tell right now, at least at this point the airline doesn't seem likely to be joining until it gets its act together and improve its condition, something similar to Garuda would be great. My expectation with this airline was quite low and my close friends thought I shouldn't even consider flying with this airline. I glad I did, flying for the experience and that money cannot buy. The cheap air ticket I purchased was definitely worth every cent of it. I hope to see an improvement in the in-flight service, some younger crew (no offence to the current ones) mixed with the older ones would be nice. If you guys are thinking of flying on this airline, go ahead. Safety record is not an issue here, as the problem lies within the management. This airline is unlikely to go burst any time soon, but if it wants to stay with the big boys, it has to do something about it, a change in the management perhaps? Thank you for reading! Hope you enjoy it.